There’s a fantastic array of YA fiction available this month, from contemporary Aussie rom-coms to murderous fantasy adventures to free verse and jazz. Find our March picks for kids books here. Written as a diary, this witty debut novel from former Buzzfeed journalist and editor Jenna Guillaume takes place over one transformative summer holiday, as sixteen-year-old Maisie Martin faces her unrequited crush on her childhood best friend head-on, and winds up unexpectedly competing in a beauty pageant. Our reviewer Lian loved this funny and warm Australian debut about one teen’s journey towards self-love, finding it ‘heartfelt and unexpectedly deep under its sparkling exterior’. Quadara is a nation divided; the four culturally distinct quadrants of Toria, Eonia, Ludia and Archia are each represented by a ruling queen. When highly-skilled teen thief Keralie steals a valuable package from messenger Varin, she becomes entangled in a conspiracy that leads to the assassination of all four queens. In possession of damning criminal evidence, Keralie is forced to flee with Varin, and the two become allies in an increasingly perilous and political situation. Multiple perspectives and timeline-wrangling increase the intrigue of this fast-paced and murderous fantasy by a debut Australian author. Seventeen-year-old Layla lives in a terrifying near-future America rife with segregation, abuses of power and racism. One night Layla and her father are forced into an internment camp for Muslim Americans. Layla is shocked that her parents would surrender to the rules of the camp. Instead, she becomes embroiled in the active resistance, alongside newfound camp friends and her boyfriend in the outside world. Inspired by harsh real-life border protection measures and the internment of tens of thousands of Japanese Americans during World War II, this is a highly political novel that our reviewer Angela praises for its ‘compelling story with complex characters and strong writing’. Best friends Noah and Walt, aka Swing, have just been dumped from the school baseball team (again) and Noah has a hopeless crush on his childhood friend Sam. Noah accepts that this is just the way things are, but Walt has elaborate plans to improve both of their situations. When Noah starts writing love poetry, after discovering some 1960s love letters, Walt interferes by sending one to Sam. Sam has a boyfriend though, and some people think he’s the person who has been mysteriously planting American flags around town. Alexander and Hess tell a compelling story in free verse, woven through with letters, Noah’s poems and classic jazz. Bookish final-year student Alice Dyson has her eye firmly fixed on her future when a strange dancing encounter with ‘bad boy’ Teddy sets the school rumour mill into overdrive and sparks an unlikely connection. Irrepressible Teddy keeps bobbing up to disrupt Alice’s plans, forcing her to look beyond her preconceptions. Slowly, a sweet and sensitive romance starts to form. Set firmly in the real world of high school gossip and bullying, this is a smart and optimistic story about acceptance, vulnerability, and being known. I read Nina LaCour’s affecting novel We Are Okay when it came out in hardcover, so I’m incredibly pleased that it is now available in Australia in paperback. Student Marin is spending her holidays in her deserted college dorm, waiting in the snowy hush for her best friend and ex-lover Marin to visit. When Marin arrives, the tension between the two girls is palpable as they begin the painful and difficult process of uncovering the reasons why Marin has isolated herself from her former life. I described it in my review as ‘a beautiful and sombre read’ and I can’t recommend LaCour’s work highly enough. The Children’s Book Council of Australia (CBCA) has announced its Notable Books for 2019. Congratulations to all the authors, illustrators and publishers – a full list of the Older Readers notables is here. The finalists of the 2018 Aurealis Awards have been announced, recognising the achievements of Australian science-fiction, fantasy and horror writers. The finalists for Best Young Adult Novel are: Small Spaces by Sarah Epstein, Lifel1k3 by Jay Kristoff, Catching Teller Crow by Ambelin Kwaymullina & Ezekiel Kwaymullina, His Name was Walter by Emily Rodda, A Curse of Ash and Embers by Jo Spurrier, and Impostors by Scott Westerfeld. Obsidio by Amie Kaufman and Jay Kristoff is also a finalist for Best Science Fiction Novel. In the UK, the longlists for the 2019 CILIP Carnegie and Kate Greenaway Medals have been announced. The Carnegie Medal is awarded by UK children’s librarians for an outstanding book written in English for children and young people, and the Kate Greenaway Medal is awarded for an outstanding book in terms of illustration for children and young people. Among the YA books honoured are The Poet X by Elizabeth Acevedo, A Skinful of Shadows by Frances Hardinge and The Astonishing Colour of After by Emily X.R. Pan. In honour of politically active teens, we examined some of the recent YA books that show young people in an activist role. And if you’re a keen graphic novel reader, you might like our roundup of six new graphic novels and comics to pick up, which includes Heartstopper by Alice Oseman, and other titles suitable for teens. 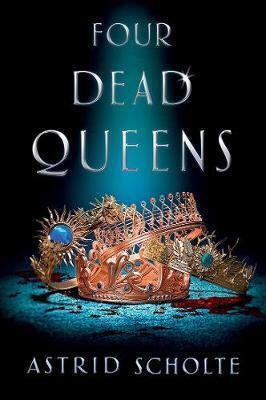 We’re thrilled to be hosting the launch of Four Dead Queens the debut fantasy novel from Astrid Scholte. Join us on Thursday 28 March 2019, 6:30pm at Readings Carlton, as superstar author Amie Kaufman launches this fabulous LoveOzYA novel. Free, no booking required.